For many years Macnab’s Bar was the only public house on the Island and has served several generations of locals throughout the years. Its most famous story is in relation to Charles Edward Stuart, known as Bonnie Prince Charlie, the leader of the Jacobite Rebellion. After his failed invasion of England he led the Jacobite army in the Battle of Culloden in 1746 but poor tactical decisions resulted in a heavy defeat at the hands of the government army. Charles escaped and whilst on the Island of Benbecula he met Flora Macdonald who, despite her father commanding the government troops on the island, agreed to help Charles escape to the Isle of Skye disguised as her maid. It was on Skye that he and Flora had their final meeting in Macnab’s Inn in Portree, which is the Island’s capital, and where they made their farewells. Bonnie Prince Charlie then fled to France where he spent the remainder of his days involved in various failed relationships and his poor public reputation meant he was never again taken seriously for military involvement for his country. Today their meeting and his escape is commemorated in the famous Skye Boat Song. 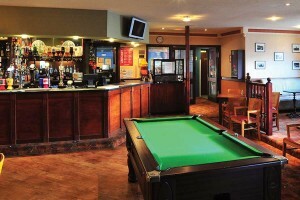 Today the pub, which stands on the site of the original Macnab’s, stocks a variety of drinks made locally on Skye. The most famous of these is the malt whisky ‘Talisker’ made at Talisker Distillery on the Island’s west coast. The bar also sells its own beer called Macnab’s Ale, as well as Red Cuillin, Black Cuillin and Hebridean Gold which are also brewed on the Island.